It was time to make room in the freezer for the post-Thanksgiving turkey (this is what indulgent moms do when they are invited to someone else’s house for Thanksgiving: Rather than enjoy getting a break on making a turkey for the family, the mom cooks a smaller one the next day so that her children and husband are not left left-over-less. ), and so the croquet balls had to go. Do you remember me writing about Barbara Kingsolver’s adventures surviving August, with a bumper crop of tomatoes? 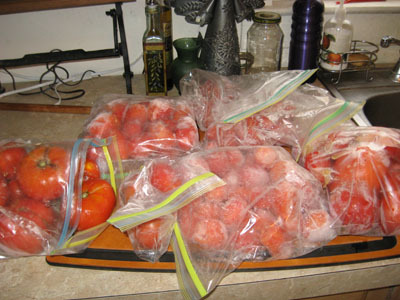 One of her more ingenious solutions was to freeze the tomatoes whole on cookie sheets, and when thoroughly frozen, to put them into zip lock bags and keep them in the freezer. This worked beautifully for me, until I needed to add the turkey. Actually, I would have had to have removed the frozen tomatoes if I’d wanted to add one more frozen pea — but let’s not dwell on my Fibber McGee’s freezer. It was time. Out they came. Several bags of Moskvich and Brandywines, as well as the paste tomatoes. It was time to cook them down into spaghetti sauce. I’m expecting company for the holiday, and what better way to lead up to turkey, than with spaghetti sauce made from home-grown tomatoes?! Can you see the frost on those rock-hard shoulders? I put the paste tomatoes in the pot first, because I’d peeled them before freezing them. 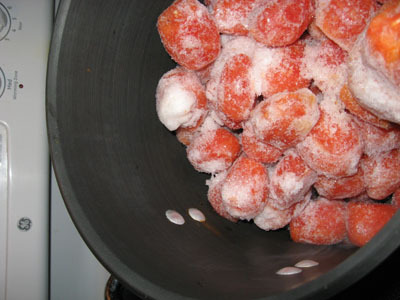 My plan was to let the larger tomatoes thaw, and then peel them before adding them to the pot. The paste tomatoes filled the entire stock pot! 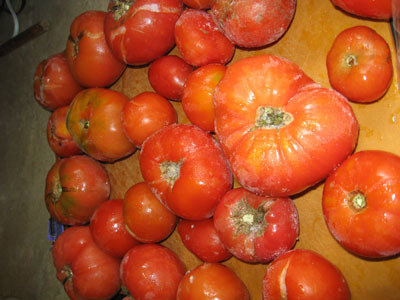 But as the paste tomatoes cooked down, I decided to toss in the whole tomatoes anyway, and deal with the peels later. 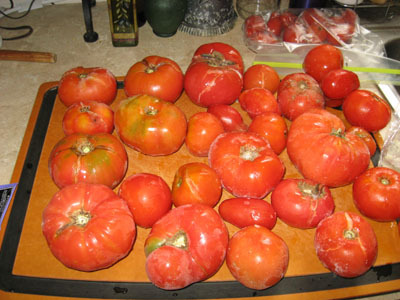 In fact, the larger tomatoes thawed quickly enough that I was able to easily core them before dropping them into the pot. The tomatoes cooked for 5 hours, and the peels obligingly floated to the surface. I skimmed and stirred all afternoon. These tomatoes yielded enough for a family dinner for 6, and a future dinner for 3 (when the two olders are back in college). Not bad for an afternoon. And, there’s room for the small turkey, and now that I think of it, ice cream! Remind me to tell you the story about Sam and the frozen oranges. Meanwhile, I am envious of all those tomatoes! They now reside in three small plastic containers. If they didn’t taste so good, the change in volume would be pitiable.